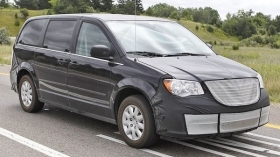 The hood and front fenders on the 2011 Chrysler Town & Country are taller to meet European pedestrian safety regulations. Over the next four years, the Chrysler brand will join forces with Fiat's Lancia near-premium brand. The two will share platforms, with Chrysler contributing minivans, mid-sized crossovers and large, rear-drive sedans. Compact and mid-sized cars will be co-developed with Lancia and be based on Fiat's Compact Wide platform. Olivier Francois, CEO of Lancia and the Chrysler brand, is repositioning Chrysler as a stylish, upscale and affordable alternative to luxury brands. Ralph Gilles, head of Chrysler's design team, says Chrysler-Lancia products are being styled collaboratively in Detroit and Turin, Italy, where Fiat S.p.A. is headquartered. Subcompact car: Last November, Joseph Veltri, Chrysler Group's product planning chief, showed a plan that included a subcompact to compete with rivals such as the Ford Fiesta and Chevrolet Aveo. The car, which is based on a Fiat platform, is scheduled to arrive in 2013. PT Cruiser: Production in Toluca, Mexico, ceased July 9. Compact car: In May, Chrysler and Fiat CEO Sergio Marchionne told analysts that Chrysler was ahead of schedule on new compact cars based on a Fiat platform. Design work is 98 percent complete and has been reviewed by focus groups, Marchionne said. That means Chrysler could have a compact sedan by the end of 2011. The car will be based on the Compact Wide front-wheel-drive platform, a version of Fiat's European Compact architecture. Fiat widened the architecture to adapt it to North America and provide the engine compartment space to handle a V-6. Sebring: The much-maligned Sebring mid-sized sedan and convertible are being restyled with new front- and rear-end treatments as well as new interiors. The restyled car is due in showrooms late this year as a 2011 model. "We have carried out significant surgery on the architecture of those cars and made significant improvements of the interiors" of the Sebring and its sibling, the Dodge Avenger, Marchionne told the analysts. The Sebring is scheduled to be the first vehicle to get a new Fiat-engineered, six-speed, dual dry-clutch transmission, which cuts fuel consumption 10 percent compared with a traditional automatic transmission, Fiat said. The dry clutch would be teamed with Chrysler's new Pentastar V-6 engine. Chrysler has improved the ride and handling of the Sebring and has added insulation for a quieter ride. Marchionne originally said Chrysler would drop the Sebring name. But sources say Chrysler is reconsidering. The company may wait for a Fiat-based redesigned model , due in 2013. Chrysler's new mid-sized sedan will be built in Italy, according to a Fiat plan unveiled in April. 300: A re-engineered and restyled version goes into production in December on Chrysler's LX platform and on sale in the first quarter of 2011. The car will arrive with new exterior sheet metal, grille and rear suspension. The car will be more aerodynamic. It will have a new interior, including an information and entertainment system with a large touch screen. Together with its Dodge Charger sibling, the re-engineered 300 will be the first vehicle to get the new eight-speed automatic transmission that Chrysler is licensing from ZF Group. Chrysler will import the ZF transmission from Germany until U.S. production of the transmission begins in 2013 in Kokomo, Ind. A 6.4-liter version of the Hemi engine is said to be in the works for 2011 SRT8 versions of the 300 and Dodge Charger. Mid-sized crossover: Veltri's presentation last November included a mid-sized crossover scheduled to arrive in North America in 2013. Little has been released about the vehicle, which also will be exported to Europe as a Lancia. The company is calling this Chrysler vehicle a CUV -- a "crossover utility vehicle" -- the same definition it uses for the larger Dodge Durango replacement due in 2011. Town & Country: The brand's biggest seller is scheduled for what Chrysler calls a "major modification" in November for the 2011 model year. The Town & Country minivan will get the new Pentastar V-6 engine, which will replace three V-6s. The front end will be re-engineered to comply with European pedestrian safety requirements and to differentiate it further from the Dodge Grand Caravan. The interior will be altered significantly. Stow 'n Go and Swivel 'n Go seats will still be offered. A Chrysler official says the re-engineering is so extensive that some in the company are thinking of it as a new model. A redesign is set for 2014.